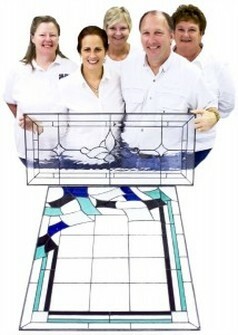 Decorative Glass Solutions is lead by Diane Nahan Fairburn who has been a stained glass artist since she graduated in 1975 from the Arts Foundation program at VCU in Richmond, VA. Since 1979, Decorative Glass Solutions has been designing custom glass panels for windows and doors from traditional to contemporary designs. Our staff of highly skilled artisans have been trained by Diane to create the windows on your wish list. Our commitment to the highest quality and best customer service assures you that you will be getting the finest custom stained leaded glass entryways, windows, and beveled glass designs. Additionally with our proprietary installations techniques, you will get a product which will look original to the glass with our seamless installation process. Decorative Glass Solutions provides installation to homeowners, architects, and builders in Virginia, Maryland, and DC. We ship our products safely nationwide. Our lead designer, Diane Fairburn, is Immediate Past President of IFDA, International Furnishings and Design Association. We have many years of experience if you are building or remodeling with your design needs. We invite you to fill out our FREE quote form, or give us a call at 804-798-8806 . Our studio and showroom is conveniently located minutes off I-95, just north of Richmond, Virginia. WE ARE OPEN BY APPOINTMENT ONLY. We also have product in the showrooms of our Strategic Partners. We are also available for onsite design consultations. Our commitment to the highest quality and best customer service assures you will be getting the finest custom stained and leaded glass entryways, windows, and beveled glass designs. We specialize in privacy glass and alternative window treatments. Stained glass is an investment you and your family will enjoy for a lifetime. We will provide you with the best craftsmanship and design to fulfill your dreams to beautify your home. Diane Nahan Fairburn was born in Long Branch, NJ where she grew up on the Jersey Shore and graduated high school. In 1975 Diane was accepted in the Arts Foundation Program at Virginia Commonwealth University in Richmond. In her senior year a field trip was taken to the Renwick Gallery in Washington, DC. The young artist was so captivated by the Tiffany Exhibit she had to leave the room and return in order to absorb all the beauty before her. 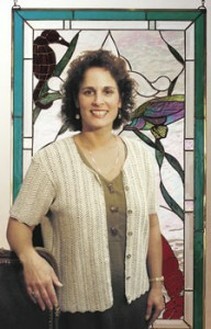 Diane started Decorative Glass Solutions (formerly known as Stained Glass Creations) in 1979 and grew it by exhibiting her stained glass boxes, cabinets, mirrors and panels at juried crafts fairs throughout the Mid Atlantic on up to New York State. In 1989 in addition to craft fairs, Diane decided to exhibit at wholesale trade shows selling to galleries and gift stores throughout the US. In 1999 Diane decided to focus 100% on architectural commissions and exhibit her work at regional Home Shows which attracted the type of customer in need of custom, privacy leaded, beveled and stained glass windows. The company is currently busy installing custom work in VA, Northern VA, D C and MD and continues to ship their custom work to customers over the country. Service work is very important to Diane and she has served as President of the Associates Council of the Home Building Association of Richmond, President of the Richmond Chapter of IFDA (International Furnishings and Design Association) as well as the International President of IFDA in 2013 and 2014. Her continued love of leaded, stained and beveled glass keeps Diane very intrigued by the endless possibilities for design ideas. She has been influenced by the styles of Frank Lloyd Wright and Louis Comfort Tiffany. Diane’s vision for the company is to continue grow the company and achieve name recognition in glass panels as her aforementioned predessors.